The Olympus OM-D E-M5 is crammed full of impressive features: the fastest autofocus among interchangeable lens cameras (or so says Olympus). The E-M5 pushes a ridiculous 9 frames per second of 16-megapixel RAW photos. It's the first mirrorless camera with a magnesium alloy body—weatherproof and dustproof, yo!—and packs the world's first 5-axis image stabilization. That's up from 2-axis in the PEN E-P3 and the E5 DSLR. But what does any of that mean to a regular person? The promise of mirrorless cameras has always been DSLR-level performance, miniaturized. That hasn't panned out. The E-M5 might fall short of the threshold too, but it's a statement of intent: The future of Olympus is mirrorless, and the graybeard Japanese camera co wants you to ditch your DSLR and get on board. The future-pushing features of the E-M5 should hammer this point home; these are specs you're used to seeing in pro-level rigs. Beyond future implications, the camera itself is a hell of a thing. The guts consist of the 16.1MP sensor designed to deliver image quality without sucking your battery dry (LiveMOS), and the latest generation of Olympus' TruePic VI image processor. There's a very cool tilting 3-inch OLED touchscreen that slides out to give you a live view of your subject; and you can focus and control the shutter just by pressing on the screen. The shutter's quiet, noticeably more so than near-competitors like Sony's NEX line, even while machine-gunning continuous shots at 9fps. Low light capability looks pretty good too: ISO runs from 200 to 25,600, and has a new technology called Intelligent High Sensitivity (IHS) that Olympus claims will let you shoot clean(ish) at 12,800 ISO. If you're going to make a run at folks waffling about moving down from their DSLRs, you've got to get the viewfinder right. Olympus gets this, and the E-M5's peep show feels as close to an SLR's as you're like to see any time soon. It's built in, so it doesn't take up your hot-shoe slot either, so there's room for attachment flashes or audio-in. It boasts 1.44 million dots and 1.5x magnification (same as Olympus' E5 SLR), and retains 100 percent field of view by not lopping off the top and bottom. It also rests in the center of the camera—just where it would be if it were on an SLR and uses a proximity sensor to switch between live view and the viewfinder automatically. It feels very pro. And while outward aesthetics usually take a back seat, it's hard to look at the E-M5 and not immediately think "X100! X100!" Because that's what Olympus wants you to think. Ostensibly, the E-M5 is built to evoke Olympus's retro OM line, but what it really wants is a piece of the crazy demand for Fujifilm's beautiful shooters. 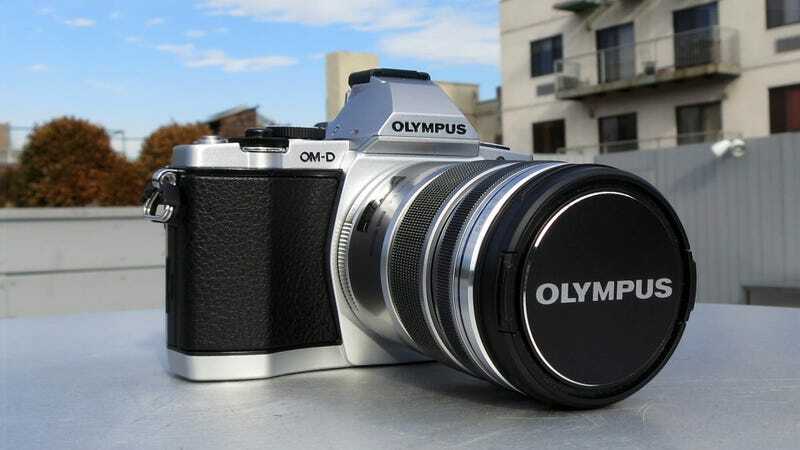 If that plan means everything coming out of Olympus is going to be as gorgeous as the E-M5, giddy up. For a while now, mirrorless cameras have been sold as DSLR alternatives. They haven't been true alternatives, not really. We haven't gotten a chance to really put this beaut through its paces, but here's to hoping it delivers on its very loud visual trash talk. It'll be available in April for $1000 body-only, $1300 kitted with a black M.Zuiko Digital ED 12-50 mm f3.5-6.3 EZ lens, and $1100 kitted with a black M.Zuiko digital 14-42 mm f3.5-5.6 II R lens.